So beautiful! Quick to arrive and looks more expensive than it is! This set is even nicer than it appears in the photos! I love the fact that it is made of lightweight aluminum, which makes it not only weather resistant, but super easy to move around. The finish is a natural brushed aluminum which give the chairs and table a high end contemporary look. The cushions are thick and firm but surprisingly quite comfortable. Assembly is fairly straightforward but does take some time and is best done with two people. Once assembled, the chairs look and feel like expensive furniture you'll see for double or triple the price. I was hesitant to spend this much on patio furniture which I could not actually see and sit on before purchasing, but I am very happy with this purchase. 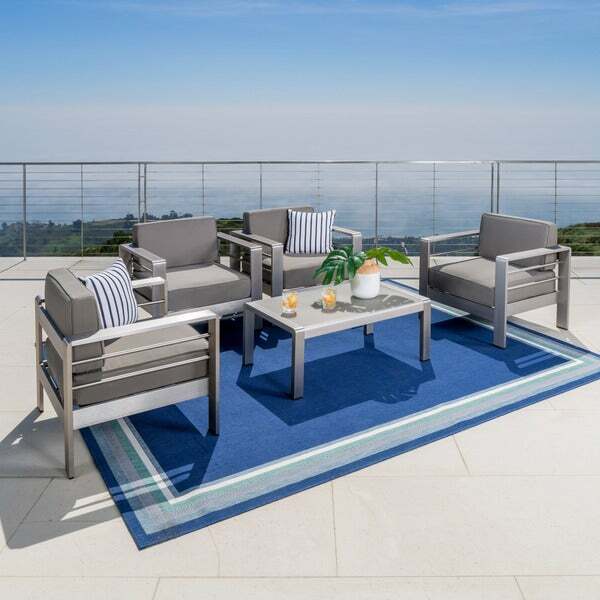 If you are looking for sturdy, sleek, and contemporary style patio furniture, you will love this set! The colors in the photos are close to real life. The cushions somewhat less grey in color depending on the lighting. I also purchased the matching chaise lounge chairs and patio table and chairs from this collection and love them all. Friends who visit always comment on how nice this patio furniture is and always ask where I purchased it. LUV This Patio Set! Went with 4 chairs and the coffee table. Perfect for my space. Everybody loves the look. Cushions are thick and sturdy. The only negative, each chair has a crimp at the bend of the arm rest. A rough spot that I hope doesn't catch fabric. Very Pleased. Large chairs. Solid cushions. Nice Set! I bought this set along with two of the loveseats to go on our new patio and firepit. We spent WAY too much time looking into furniture options and almost got to the point that I was nervous if we'd like anything. This set showed up in about 82 boxes, okay it was really five but it was a lot of boxes. The good news is that they are pretty easy to assemble. Each one takes about 10 screws and you are up and running. It takes a little time to get the whole set put together but when it gets done, you'll love the look. Pros: Absolutely beautiful to look at, matches our patio amazingly, very sturdy, fairly comfortable to sit in. Cons: The cushions are a little firm (hoping that changes with time) and there were a couple imperfections in them ... some little scratches. Nothing to go crazy about but not super thrilled either. Overall, I'd buy these again. I absolutely love this set. It's easy to assemble, sturdy, comfortable and looks fantastic. The fabric on the chairs is much better quality than I expected. I highly recommend if you like contemporary furniture. I had it in my cart but not ordered yet; unbeknown to me my daughter had it! So that's when I ordered it right away. Could not be happier! Easy to put together, very light and therewith very easy to move around. Nice cushions, good quality and upscale looking. I bought the 2 chair-with-sidetable set also and it makes a very good looking set. 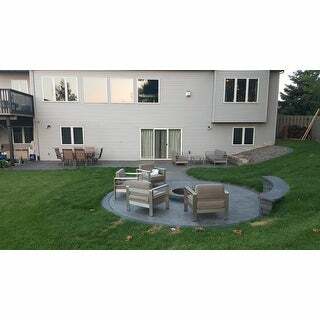 Worked great in two outdoor seating areas I recently designed. Very comfortable and look great. Wish I ordered the sunbrella cushion covers when I placed my order. Beware you cannot order them after the fact! Khaki cushion covers don't look like they will be durable. Very nice looking, modern furniture. Easy to put together. I put it together alone, although they recommend two people. Sturdy. I take cushions off when not in use. "Do you sell the carpet in this picture?" You may enjoy item# 13874977, 19180869, or 21866043.